We were very lucky with the weather we had in Kingston last weekend, but on our last day I woke up to dark, overcast skies. To read my accounts of our sunny days in Kingston click here and here. But checking the weather on Sunday morning, I saw that the meteorologists were calling for rain. Setting out from my hotel, I woefully (Sullenly? I may have been pouting.) donned my raincoat. Once outside, I saw that it wasn’t raining, but rather “misting” in the delightful manner of British rain, which I had become so accustomed to during my year abroad. I pulled my hood over my head, sunk deep down into my coat, and started the long walk down Bagot Street and through City Park to Queen’s University campus. 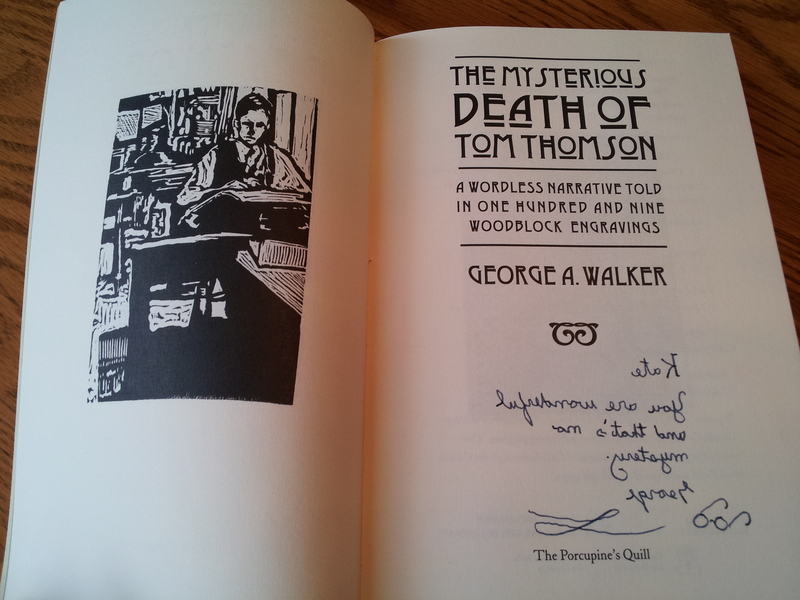 Today George A Walker was giving a talk on his book, The Mysterious Death of Tom Thomson at the Agnes Etherington Art Centre. The Agnes Etherington Art Centre is a gallery that sits nearly smack dab in the middle of Queen’s University. It was once the home of Agnes McCausland Richardson Etherington (1880–1954). In her will, Ms Etherington bequeathed the elegant Neo-Georgian mansion to Queen’s University for use as a university and community art gallery. The gallery was opened to the public in 1957. Since then, many additions have been made onto the building. The house is now maintained as a sort of exhibit itself, laid out in a manner reminiscent of Ms Etherington’s day. It was a favourite pastime of mine when at Queen’s to take a day off in the gallery, looking at the historical rooms and their furnishings. I was told, I believe on one of those silly ghost tours of Kingston, that Agnes Etherington haunts the old mansion. But whether that is true or not, I cannot say. I can say with certainty that there was no haunting during George A Walker’s talk that afternoon—except perhaps by the ghost of Tom Thomson himself. The talk was set to begin at noon, and after a few technical problems with the microphone, we were off. George started by talking about Tom Thomson the man, discussing the artist’s influences. He began with Thomson’s time spent at Grip Ltd., the graphic design firm in Toronto. Demonstrating the artistic climate of the time, George showed us several examples of Thomson’s design work, as well as images of iconic design from the turn of the century. Next George showed us a series of Thomson’s landscapes. He compared them to the artist’s work at Grip and discussed how Thomson’s unique painting style was developed. As we listened with rapt attention, breathtaking scenes of Northern Ontario played before us, flashes of colour, glimpses of a vast sky. Next, George turned to his own artwork. Why wood engraving? George described the process of wood engraving, discussing the tools and techniques wood engravers use to make marks in end wood. He explained why this art form in particular appeals to him, telling us about the interesting play it allows between positive and negative space. When carving into a block, you are carving away the parts you do not want to print. In essence you are reverse drawing: any mark you make becomes negative space, while the space you leave untouched becomes positive. George jokingly said the backward nature of wood engraving suited him perfectly, as it finally made his dyslexia a strength rather than a weakness. I think many can appreciate George’s resourcefulness. George showed us images from The Mysterious Death of Tom Thomson next, demonstrating how he chose the images to include in his wordless narrative. In his research, George found archival photos of Yonge Street at the turn of the century. One picture in particular caught his eye; it depicted an automobile deep in the mud on the road. Roads during this time were notoriously muddy, and it was not uncommon to become stuck. No wonder Thomson wanted to escape to the country, George told us. George also showed us the way he worked interesting details into his work. Thomson appears in most images, he told us as a red circle swung into his powerpoint presentation, picking out Thomson in one of George’s crowded cityscapes. Searching for Thomson through the prints creates a bit of a “Where’s Waldo” challenge for the reader. 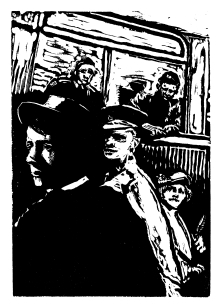 Another interesting tidbit George shared was a woman he inserted into the scene on the Toronto trolley. During this time, most young men where off a war—a fact that George makes clear through his reproduction of WWI posters throughout the book. There were women in these days that would carry white chicken feathers and would pop them in the breast pocket of any young man they saw out of uniform. Thomson was denied entry into the Canadian army, so he would have been out of uniform. George imagined a young lady carrying a white feather, shadowing Thomson on the trolley. (Scroll down to see this image from George’s book.) It is these details that make George’s book such a delight to read. As a final point, George shared with us the creative way that he sequences his wordless narratives. After carving and printing several blocks, George told us he shuffles the images into a pile, trying out different sequences. When the pieces begin to fall in place, George may discover gaps in the storyline. He might find that there is something missing between this image and that one, and so back he goes to his desk, his wood engravers tools about him, his piles of blank blocks to the side. Tom Thomson is depicted on the left, the woman with the feather on the bottom right. After George’s talk we applauded loudly. As I rose and headed over the book display, the crowd began to mingle and chat. I was happy to get to say my hellos to George and Michelle and delighted I had the opportunity to meet Jan Walter, with whom I had been corresponding about the event for several months, in the flesh. George was gracious enough to sign my book (backwards!) with a flair—and with that I had to be off. I had plans to return to the city that afternoon. When I stepped outside, I could see the rain had held off while we sat in the exhibition room of the Agnes Etherington Art Centre. I looked back at the gorgeous brick mansion, one of my favourite buildings on Queen’s campus. Someone told me that Agnes used to keep a vigil on her second floor balcony, waiting for her husband to return from his long trips away from home. They told me she continued this tradition, even long after her husband had died. Who knows if this is true? Who knows if her ghost still walks those old rooms? But then, as George says, some stories are meant to remain a mystery. George signed my book backwards. Can you decode the message? Thank you to everyone who helped make the Kingston WritersFest possible this year. To read my account of our time there from the beginning, click here. 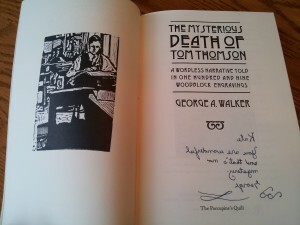 This entry was posted in Letters from the Porcupette (the Intern's Blog) and tagged George A Walker, Kingston WritersFest, Kingston WritersFest 2012, The Mysterious Death of Tom Thomson. Bookmark the permalink.